Licensing does not allow copying of Windows fonts to web servers or other commercial software. So only free fonts (like ‘DejaVu’, etc.) or other fonts (available for redistribution) can be used for reports generation, but they are usually not installed in Windows, especially when the software, using the report engine, is designed to support the unlimited end users. The possibility to embed (include as embedded) used fonts into the generated DOCX report file solves the described problem without the need to install used fonts in end user computers. 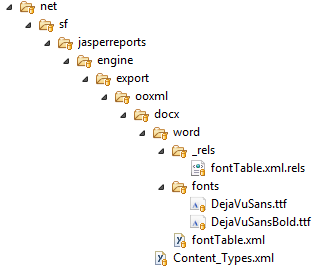 1) DOCX parts in ‘/word/fonts’ folder with the content of the fonts used in Jasper report (e.g. added files ‘DejaVuSans.ttf’ and ‘DejaVuSansBold.ttf’) were created. This is very helpful. But I was wondering how common is for people to embed fonts into DOCX documents. Especially since embedding the font files makes the documents much larger. I was wondering if you could send one of the DOCX files you generated on your side, using the approached described above. I am particularly interested to see if the font files need to be obfuscated or whether embedded fonts work on Office on Mac. I attached one of the DOCX files, generated using the approach described above. Usually we use PDF format for various reports, and we have no problems with fonts. However, this time we got the requirement to have the same information in DOCX format, so that it could look like as in generated PDF file, but can be editable before printing official papers. Draft papers are negotiated in electronic form with the staff of other institutions, so we stuck with Windows fonts licensing issues (as our software works in Linux), and we had to embed font to DOCX file in order to solve this issue. Fonts embedding in DOCX file for all generated reports also closed multiple complaints from other users of the application like the same information generated in PDF format file looks differently than in generated DOCX format file. This is not the first project, where we had to embed fonts into DOC/DOCX file, so I think that the possibility to embed used fonts into the generated DOCX report will solve many issues.